Great News; "A Skylark Sings" is to be published on January 29th!!!! At Last. I have some advanced copies and it looks Great. This book is published by Austin Macauley and will be available in time on all e-books formats as well as Hardback and Paperback. This is the blur on the back of the book to give you a taste of it. A Saboteur is loose on the film set of the WW1 BBC production of the book, A Skylark Sings. The motive is obvious from the start but the perpetrator is not so easily identified. The Saboteur baits the police before ramping up the number and severity of incidents, putting lives at risk. After actor Alex Ward and his girlfriend Elisabeth Ireland, save the life of the executive producer from his car after the breaks have been cut, they become the targets for the saboteur's fury. Lives lived in 1916 are now brought back together for either good or ill as the past catches up with the present, but who will survive the encounter this time around? This novel has a lot to do with past lives and half the book is set in the present and half in 1916 with Mary carter and Nipper, an Australian soldier and his fight for survival in Gallipoli and on the Somme. It is both a thriller and love story but most of all how our souls travel through time and never really die often meeting the same souls time and time again. I don't think you can get Kindle versions of Day trips and KM any more and this is because they want a lot of money to put them on their sites so I decided not to pay this extortionate amount when I get so little back. October, I am now waiting for the publication date for SKYLARK and will let you now when it is coming out. This Sunday 3rd of December I am back at Alton Community Centre for a huge Christmas Fayre and I will have my novels with me and they make great Christmas presents. Come and say hello from 10am to 4pm. I will be doing a signing and selling copies of "Day trips to Heaven" and "Karma Neutral" on September the 16th 2017 at the Alton Psychic and health fair at the Alton community Centre. Come and say hello and buy a signed coping for less than the retail price. A win win situation. Karma Neutral is now available on all digital platforms. Unfortunately I didn't win but at least it got into the final 35. I will be at Basingstoke Spiritualist Church on Saturday 23rd of April to promote the book. If you live close by come and see me. I have just had the news that "Day trips to Heaven" is a finalist for the Wishing Shelf Adult fiction Award for 2015 which is amazing! I will hear on April Fools day if it has won. Fingers crossed!!!! I am now approaching publishers of SF novels to get my "Solar Star" spiritual SF novels published. I hope it will easier than it was to get anyone interested in my other novels!!! The artical in Psychic News looks great. To download it scroll down this page and you will find it. To read the first two chapters please return to the My Novels page. I hope you like it enough to want to find out what happens! Please tell your friends if you like it and write a review as this will help get them to more people. Many thanks. Day Trips to Heaven is also available as an eBook (ISBN 978-1-910027-04-2) on ALL platforms. Karma Neutral, is also now available in paperback and eBooks on Amazon and other sites. 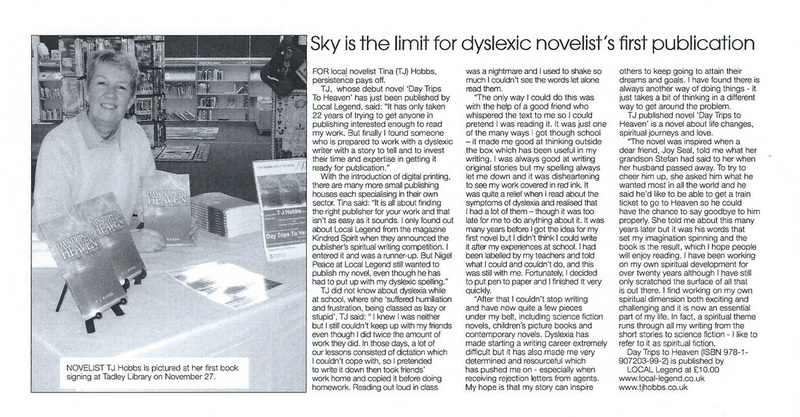 I am doing a book signing at Tadley Library on Monday 16th of November from 9.30 am until 12.00 and again on Saturday 21st of November from 9.30 until 12.30. Come and say hello and get your copy of either novel signed. Also look out for an article I have written about my writing which is coming out in the Psychic News magazine in January 2016 and another in the More to life magazine.